The weeks just seem to fly by just lately, it's Sunday again already, that means a new challenge over at CD Sunday, this week the challenge is entitled "Tag It", so you could make some gift tags, very useful at this time of year, or do as I have done and use some tags on a card. I'm using one of other fav colours apart from purple, left to me everything would be purple, so I really have to make a conscious effort not make a purple project. I do hope you like it. 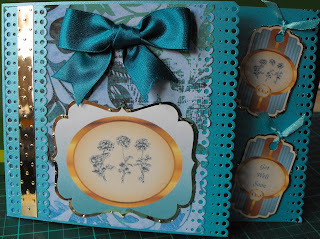 The base card is my all time favourite Centura Pearl from Crafters Companion, the dotty mirri is a Kanban special from QVC images and papers are from the new MCS Papercraft Library. The edges and ribbon strip are punched with an MS punch. Wendy - this is so pretty and love all the shiny elements! What a pretty card! Love the image too, Thanks for joining us this week at Pattie’s Creations Design Challenge. This card is so cute! Thanks for playing along with us at Crafty Sentiments! Hope to see you again! OMG those color looks AmAzing together. Blue is my fav color so I gotta try this combo one day. Thanks for joining Pattie's Creations Design Challenge this week. Merry Christmas and happy New year. This is a gorgeous card! I love the design and the colours! Very cute! Love it. Thanks for playing with Going Grey with Scrap-Creations! Your creations very well done. Love what you did with the punches!! Thanks for playing in our challenge! DT member Team 2 for Pattie's Creations Challenge! Your card is beautiful! So many lovely details! Thanks for joining us at Pixie Dust this week! What a gorgeous colour. Love how you have used your tags to really enhance this lovely card. Merry Christmas and Happy New Year and thanks for joining our Tags spotlight. Hope to see you back next year. So beautiful Wendy, the colour is stunning.